A simple and easy three ingredient cookie. 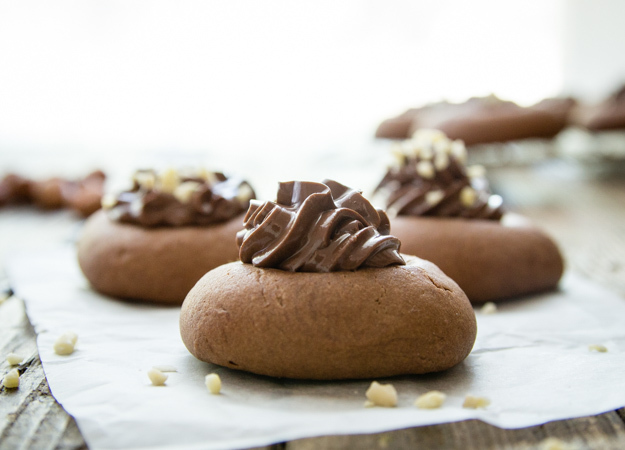 These Nutella Cookies aren’t stuffed with Nutella but baked right in the cookie and then topped with a heaping spoonful! 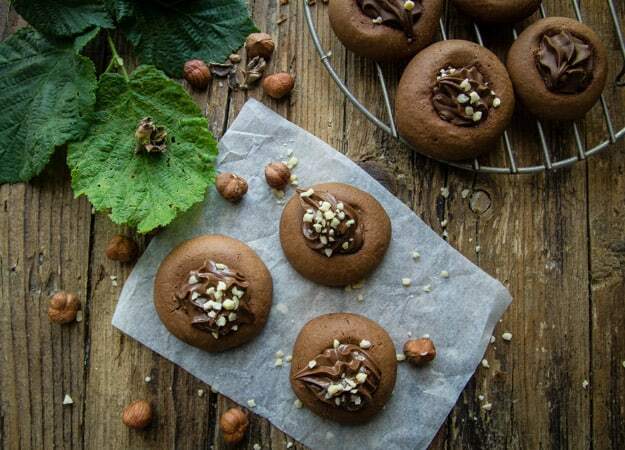 Italians love their Nutellotti Cookies and I am sure you will too, made in one bowl and baked in minutes, believe me they will be gone in minutes too! If you remember my calling my youngest daughter the Nutella Queen from when I started An Italian in my Kitchen, you will know that from the first time she tasted that Creamy Hazelnut Spread she never looked back. In fact when she was little, I would have to hide the stuff because she went through it faster than I could buy it. As she grew and discovered the internet she also discovered many recipes to use with Nutella. How many times did I hear “Ma I found the perfect recipe, can you make it”? Some I did, some I didn’t, but these Nutellotti Cookies were ones that were always on the to do list. Looking in the cupboard I noticed a jar and a half of the stuff and decided I would finally make these cookies. Sometimes I am a little sceptical of 2 or 3 ingredient cookies. Who knows why, but that doubt is finally passing. 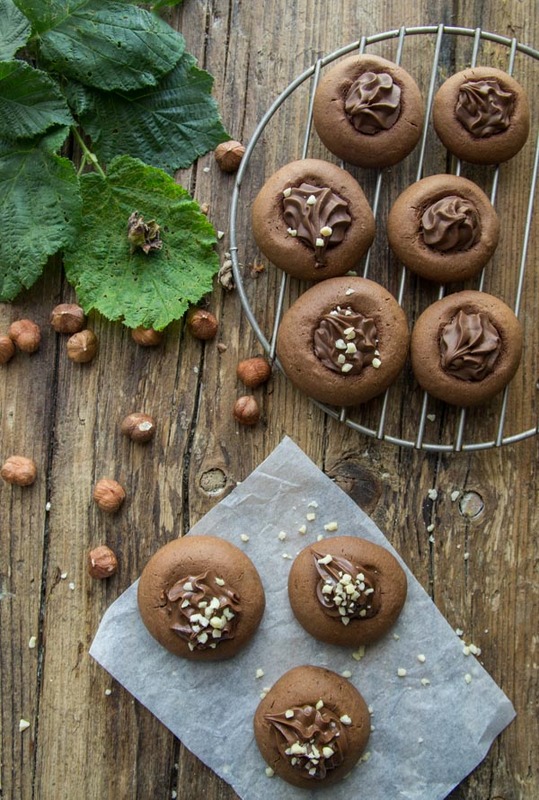 Especially after my Amaretti Cookies and now these Nutella Cookies Recipe. If I thought the Amaretti were quick to make, well these are even quicker. While the dough is firming up in the refrigerator your oven can be warming up. I did a little research on these cookies just to see how others made them, the recipe I chose was from Giallio Zafferano . I discovered that some add the dollop of Nutella before baking and some after. I decided to do both, just to see which we liked better, so which one won? They both did, depends on your taste. My husband preferred the one added after baked because he said it seemed creamier, and our friend preferred the one added before baked because he said the Nutella seemed less sweet. My daughter, well she didn’t care! 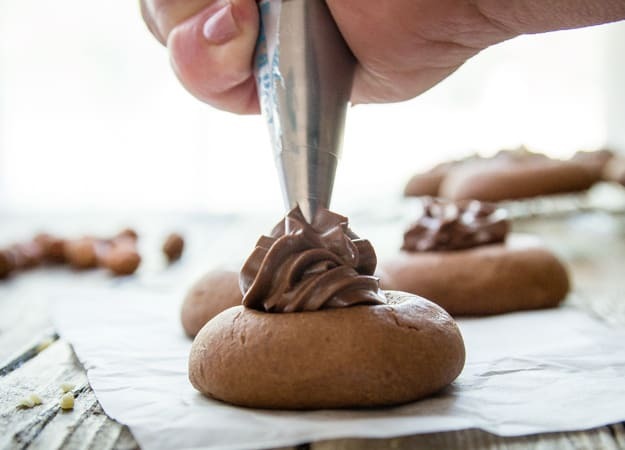 So if you decide to make this Nutella Cookie Recipe, let me know which you prefer. Enjoy! 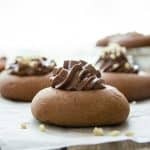 Nutellotti Cookies, Nutella Cookies, three ingredient Italian Cookie recipe, fast and easy, a delicious Snack or Dessert idea. In a medium bowl beat for approximately 2 minutes Nutella and egg. Add sifted flour and mix with a spatula or wooden spoon. Form into a ball, wrap in plastic and refrigerate for 20-30 minutes. Pre-heat oven to 350°F (180°C), line a cookie sheet with parchment paper. Remove dough from fridge and roll into 10-12 balls, with finger or bottom of wooden spoon press down the center of each ball, making a deep well in the middle - deep but not too wide. Fill a pastry bag with Nutella. 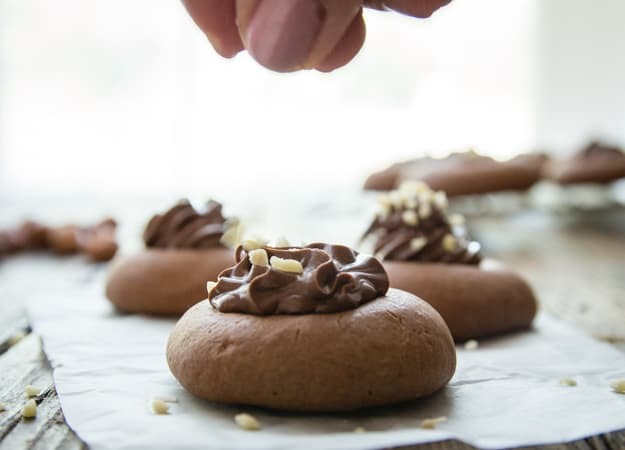 Depending on how you like your cookie (or do half and half and then decide), fill the unbaked cookies (or leave unfilled) with Nutella and Bake for approximately 10-15 minutes, cookies will be a little soft but will firm up while cooling. Cool completely before filling unfilled cookies with Nutella. Sprinkle with chopped nuts if desired. Enjoy! **dough will be soft and hold together, add flour gradually. ***Make sure the Nutella is nice and soft and not too hard. Delicious! Not overly sweet which I love. Simply yummy! Thanks Kristin so glad you like them. Definitely will be making these. I think I would prefer to fill the cookies after they’re baked. I know I’ll most like triple the recipe so I can have enough for the entire family. Thanks for another great recipe. Hi Ann, I know my husband said “they are finished already”! Have a wonderful weekend.